JQ Talks: My iPhone 6 Has "Touch Disease" And Some Say Apple Did It On Purpose. My iPhone 6 Has "Touch Disease" And Some Say Apple Did It On Purpose. I've been using my iPhone 6 for about 3 years now and it's working fine other than it being a bit slower now, sometimes may even lang, and camera quality on as great as other newer phone models, which all these I've already expected it to happen as it's normal as technology keeps getting better daily. However, the most annoying part of my iPhone 6 is that for the past 6 months or so, it suddenly contracted this thing known as "Touch Disease", where my screen does not respond properly to my touches anymore. Sometimes it works fine but many times it goes wonky on me, which bugs me tremendously. Imagine when you are in a rush and want to get your message out quickly, well, nope it choose to disobey and instead of a backspace, it touches on enter or send message before I complete my sentence. I was wondering what's wrong with my phone and I genuinely thought to myself, "it's probably time for a new phone" and I honestly did have an intention to purchase another iPhone. That's until my husband told me about a lawsuit on the iPhone 6 where Apple allegedly "did it on purpose". 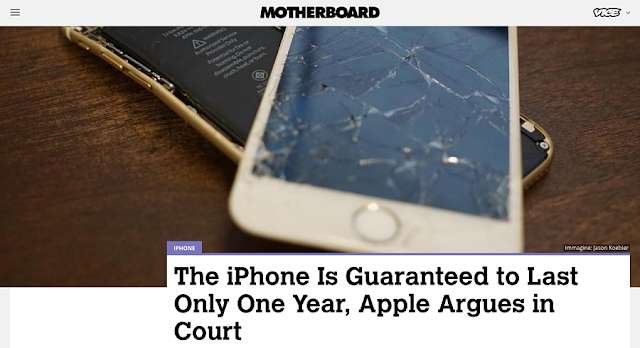 According to Motherboard, Apple mentioned in court that you can only legally to expect your phone to last for just one year. What happen to Apple makes the "most durable devices"? So, you only make your phones to be able to last for a year? I'm shook and totally cringed towards Apple's statement provided in court. I've been using the iPhone 4, iPhone 5, and until now, the iPhone 6. Since I've started using it, I thought that it's a reliable device, thus, me being loyal to Apple all these years despite the crazy high prices. Now, to personally experience this issue and having to read with my own eyes to what Apple has to say about their devices, I think I'm ready to jump. I'm ready to switch brands. It's overall disappointing on this news and also to hear that the judge dismissed the case as the plaintiff was said to not have proper evidence on the claims. Whatever it is, I guess I'm done with iPhones for now.